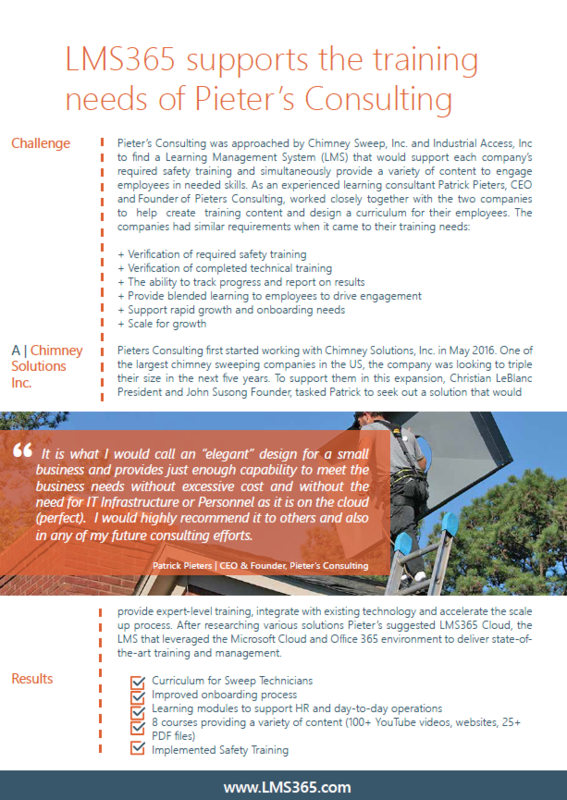 Pieter’s Consulting, established in 2005 out of Marietta, Georgia, was approached by Chimney Sweep, Inc. and Industrial Access, Inc. to find a Learning Management System (LMS) that would support each company’s required safety training and simultaneously provide a variety of content to engage employees in needed skills. As an experienced learning consultant Patrick Pieters, CEO and Founder of Pieters Consulting, worked closely together with the two companies to create a training program built in Office 365 with LMS365 Cloud. Download the Case Study to find out what challenges the two companies faced and how these were addressed.